Tufloc No-Drill Roll Bar Mount Gun Rack FREE SHIPPING! The No-Drill Roll Bar Mount Gun Rack from Tufloc easily installs with ordinary hand tools. The rack features high-security clamps that create a low-profile rack that doesn't take up much head room or hamper driver visibility. The rack offers storage flexibility for most weapon models, including muzzle direction and horizontal or hanging stocks based on user preference. 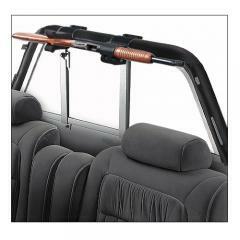 It accommodates any roll bar configuration or weapons rack system. The rack's durable construction features heavy-duty steel with a powder-coat finish. Padding eliminates any rattling and keeps weapons protected during transport. Access the dual-release lock with a key or 8-second delay timer. NOTE: Please allow three-four weeks for this special-order product. ©2002-2019 CopsPlus.com: Tufloc No-Drill Roll Bar Mount Gun Rack FREE SHIPPING!